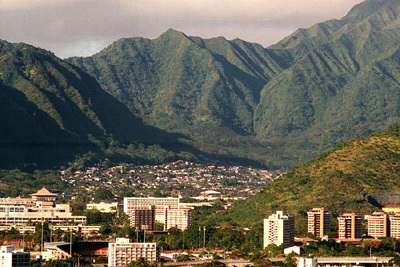 In the heart of the city of Honolulu lies the Manoa real estate, a beautiful green suburban area. The place has lots of character. For most people, it is the best option to live in or near the town. The houses found in Manoa are older. They have a charm to them, as they are set along streets lined with large trees and nice views of the mountain. Of course, you can never miss out all the rain. In this charming area, you will also find a small little shopping center and great coffee shops. On the average, Manoa gets over 200 inches of rain a year. This is what makes the place so incredibly beautiful. Ideally, a picture of Hawaii may look like this: a typical rain forest with huge trees and surrounded with all kinds of green plants. This is how Manoa looks like. However, not all of Hawaii looks like the setting I’ve described. There several parts of Hawaii that is brown all over and everything looks dead. In fact, the Ewa and Kapolei side are one of the said brown areas. If you’re at this side of the island, you may think it doesn’t rain at all here. It definitely looks more like California in the summer. The rain definitely gives Manoa its great scenery; however, it is also one of the things people hate about this town. It rains almost every day, especially in the winter. As you drive around this place, you’ll begin to understand why people love it here. Initially, the ocean attracted the people, who move to Hawaii. Then after living here for quite sometime, the tropical valleys and mountains will start to attract you more and more. The old houses in Manoa are regularly renovated. These houses are some of the most appealing and charming properties on the island. However, as many of the Oahu’s older home, these houses weren’t built up to par to today’s standards; these houses need to be modernized. You’ll have to note that if you renovate a house by yourself, you stand a better chance of making a profit. One of the properties in Manoa was recently sold for over $2.1 million. This may seem to be a high price, though it must be noted that Manoa is only a short drive from downtown. Thus, most of the island’s professionals choose Manoa as their home location. For those who commute to town everyday, Manoa is the perfect blend of small city and country feel. As soon as you get inside Manoa Valley, you can feel the difference in humidity. It’s a tropical rain forest filled with modern houses. Manoa has one of the best public schools in Hawaii. Their best public elementary school has continuously and consistently scores high in testing. The housing prices here are usually out of reach for families; those who can afford and are lucky enough to live here can enjoy access to an exceptional school. The University of Hawaii is also located in Manoa. The student population is high; thus, you’ll see plenty of people traveling around on bicycles and mopeds. Law considers mopeds bicycles here; riders don’t need insurance and license. Going around Manoa will make you feel that you’re in an Victorian town, with the exception of the temperature that is 85 degrees together with 75% humidity. The beautiful streets and Victorian style architecture creates a feel that you’re not in Hawaii but in a different world, until you look behind you and see the ocean. There are plenty of trees in this area, and all the nearby houses have nice green grass. The area also has a beautiful view of the valleys and mountains. Listing courtesy of Agora Hawaii. Listing courtesy of Hawaii Property Managers.